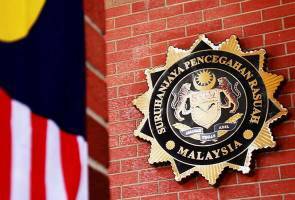 KUALA LUMPUR: The Malaysian Anti-Corruption Commission (MACC) is finalising investigation papers (IPs) on three high-ranking civil servants who were detained on Aug 15 in connection with corruption, abuse of power and money laundering. MACC Strategic Communications Division director Abdul Samat Kasah said the trio, one with the title ‘Datuk’ and another ‘Datuk Seri’, had been released on police bail while waiting for the IPs to be finalised before being submitted to the Attorney-General’s Chambers (AGC) for the next course of action. “All of them were released on police bail. This does not mean the probe is over as the IPs are still being finalised before they are handed over to the AGC for further action. “The cases are taking some time as it involves seized assets worth millions of ringgit,” he told Bernamahere Monday. The three men, who are attached to KL City Hall, Public Works Department (JKR) and Tenaga Nasional Berhad (TNB), were arrested in simultaneous operations in Kuala Lumpur, Malacca and Kelantan. The 54-year-old ‘Datuk Seri’ from DBKL was released on Saturday after he was picked up at his office at 3.07pm on Aug 15. The ‘Datuk’, a 56-year-old attached with Melaka JKR was released on Thursday. The other suspect, a 47-year-old senior officer of TNB in Kota Bharu, Kelantan was released on Sunday. They were all released on RM300,000 bail each. MACC Investigations director Datuk Azam Baki said following the arrests, the commission had frozen bank accounts of the suspects with amounts totalling over RM13 million, including their savings and unit trust shares valued between RM1 million and RM6 million each. Also seized were several luxurious condominium units including a penthouse and a bungalow, as well as Maserati, BMW and Audi cars. The operations were conducted in line with newly-appointed MACC chief commissioner Datuk Dzulkifli Ahmad aim to ‘clean up’ the civil service of corruption, misappropriation and abuse of power.